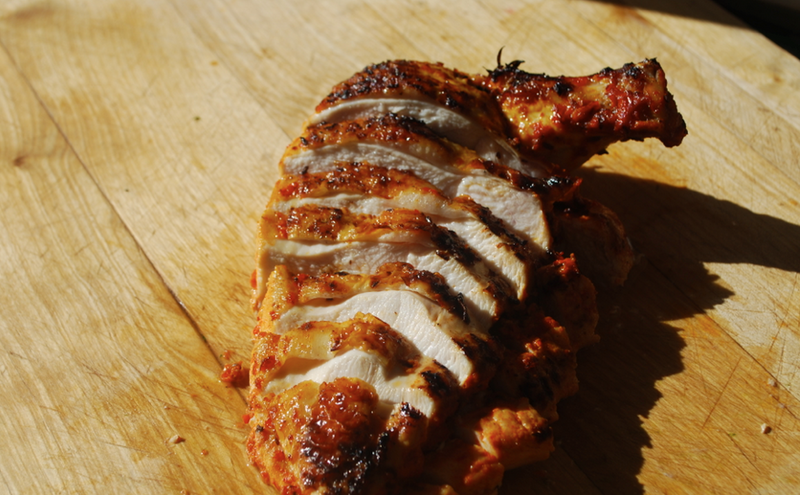 These are a BBQ favourite but equally delicious cooked in the oven. They are much more fun than a normal burger, packed full of mellow, spicy flavour. It is really worth trying to introduce different cultural flavours to children; it is amazing how open they are to new tastes. You can also make mini burgers for very small kids and serves them without the naan and with the raita as a dipping sauce. The spices used in this recipe are a great natural anti-inflammatory. You could serve these burgers with crunchy carrot coleslaw to boost the immune system. Place the chopped up chicken in a bowl and mix in with all the other ingredients. Divide the mixture into 8 balls and flatten in your hand to make thin disc like burgers about 2 cm thick. 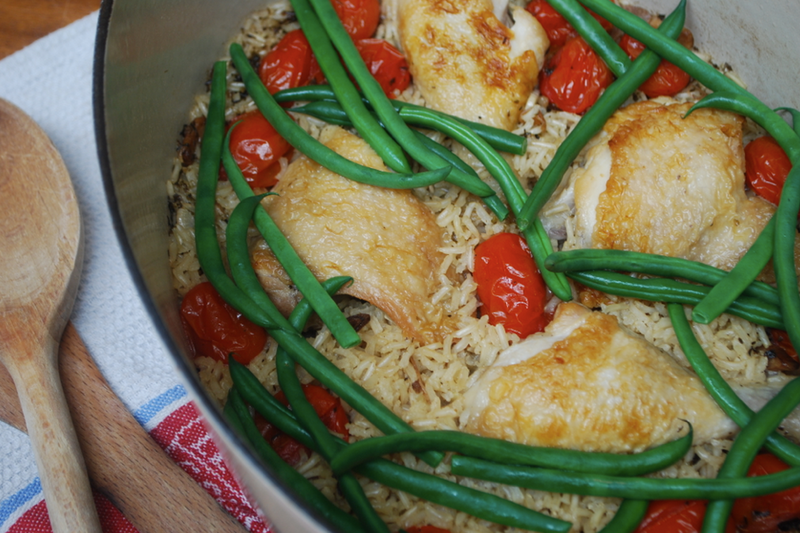 Place on a plate and leave to chill and firm up for 30 minutes in the fridge or if not in a rush you can leave for up to 24 hours and allow the flavours to develop more. Lightly oil a baking tray and place into the oven a minute before you are ready so it can heat up slightly. Cook your burgers for 5-6 minutes each side, turning in between (they should take on a bit of colour). Meanwhile get on with making your yoghurt dressing. Just mix the chutney and yoghurt together in a bowl. Pop your naan into the oven to heat through for a few minutes (it will soften a lot and be much easier to bend). 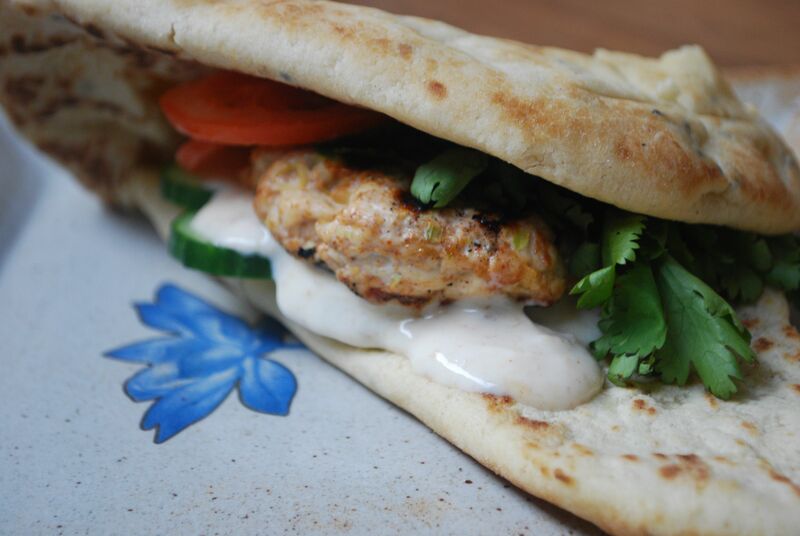 When ready to assemble place your chicken burger on top of one half of the naan, dollop on lots of mango raita and pile with sliced cucumber, red onion and tomatoes before folding the naan over to create a bun. 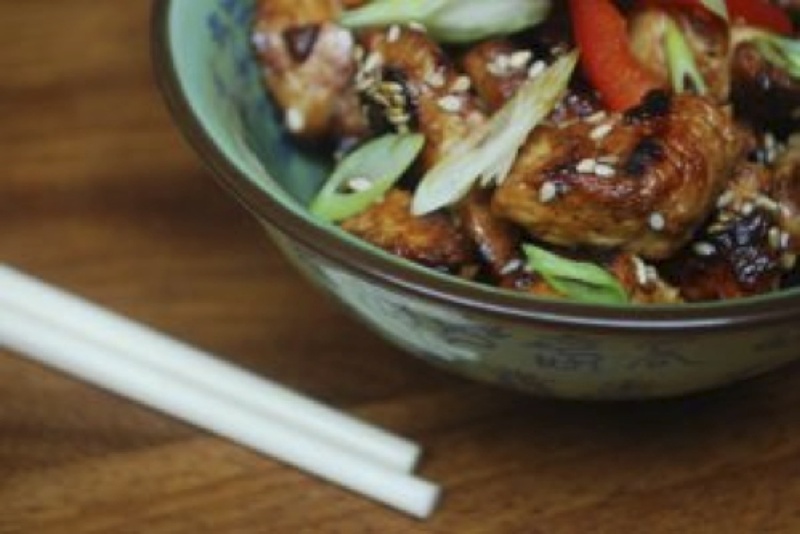 Serve with a crunchy bean and mange tout salad topped with sesame oil and seeds. Freezing: You can easily freeze these in advance so you can have them to hand for any occasion. Place your shaped raw burgers onto a tray lined with silicone, lay another sheet of silicone on top and wrap with cling film. Allow to freeze before placing into a labeled zip lock bag. The raw patties will sit happily in your fridge for up to 24 hours. You can take out and cook straight from fridge. The mango raita can be fully prepared and left in you fridge for a day or two just give it a little stir before serving.